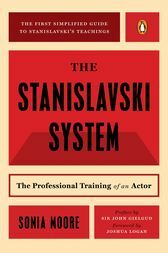 This clearly written guide to the Stanislavski method has long been a favorite among students and teachers of acting. Now, in light of books and articles recently published in the Soviet Union, Sonia Moore has made revisions that include a new section on the subtext of a role. She provides detailed explanations of all the methods that actors in training have found indispensable for more than twenty years. Designed to create better actors, this guide will put individuals in touch with themselves and increase personal sensitivity as well. Sonia Moore was a theater director and an expert on Konstantin Stanislavski and his acting method. Founder and director of the American Center for Stanislavski Theater Art and the Sonia Moore Studio of the Theater, she also wrote extensively on the Stanislavski method, including The Stanislavski System and Training an Actor: The Stanislavski System in Class. Moore died in 1995. John Gielgud (1904–2000) was a legendary English actor and director, who was recognized as one of the “great trinity of theatrical knights” with Ralph Richardson and Laurence Olivier that dominated the West End and Broadway in the twentieth century. He also appeared in more than 60 movies and won an Academy Award for Supporting Actor for Arthur. His writing credits include An Actor and His Time and Distinguished Company. Joshua Logan (1908–1988) was an award-winning American director and writer. He directed the Broadway productions of Annie Get Your Gun, South Pacific, and Mister Roberts. He shared the Pulitzer Prize for Drama for cowriting South Pacific in 1950 with Richard Rodgers and Oscar Hammerstein II, and the Tony Award for writing Mister Roberts with Thomas Heggen in 1948. He also directed Hollywood movies and was nominated for Academy Awards for Picnic and Sayonara.